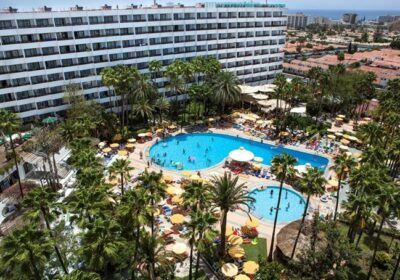 Eugenia Victoria Hotel, Playa Del Ingles, Gran Canaria Free Child Places Low Deposit Family Holidays @ Web2travel Deals. Finding the Best Value Holidays to Gran Canaria from UK airports. The 4 star Eugenia Victoria Hotel is a popular choice for family holidays. Don’t judge this hotel by the star rating as most guests rate it better than some 5 star hotel. It even has a Wellness Centre! 10 minutes walk from the hotel to the centre and sandy beach. Free bus to beach if you don’t want to walk. Recently renovated to a high standard, rooms are spacious, comfortable with a fridge, TV and hairdryer. There is no air-conditioning, but you do have ceiling fans in lounge area and bedroom. Amazing swimming pools for older children and the splash pool area is a big hit with the little ones. Great pool area, with plenty of cushioned sunbeds. Lot’s of entertainment and mini-golf. Very friendly and helpful staff. Food is very good, with such a wide choice of dishes. 14 nts All Inclusive from £3,177 (total family of 4 with 1 free child place) inc flights from Newcastle 7th Jul 2018 (Saving up to £1,039). This hotel is situated on the edge of the Playa Del Ingles resort and is 35km west of the airport. The hotel runs a free shuttle bus to the beach, 950m away. A 15 minute walk will take you to the shopping centre Kasbah. The Eugenia Victoria Hotel may offer free child places which is ideal for cheap family holidays in Playa del Ingles. Prefer Flight Plus Hotel Deals? without free kids places. This is a great all round hotel that suits all types of holidaymaker due to its fantastic location. Wonderful facilities and it even offers guests a champagne breakfast. Each room has up to 3 beds as well as having a bathroom, satellite TV, fridge, telephone, hairdryer and balcony from which you can enjoy great views. Please note that some rooms do not feature a balcony. The hotel has a large swimming pool (heated in winter) and a childrens pool with sun terraces and a poolside bar. There is also a pub, another 2 bars, a buffet restaurant and a TV lounge. There is an extensive entertainment programme for adults and children of all ages, a games room with pool, table tennis and other table games, tennis and squash, snooker, mini golf, a gym, a children’s playground and a cyber-cafe. WiFi is also availabel in all public areas. The Spa & Wellness centre has an indoor pool, sauna, roman steam room, osmosis pool with massage streams, Jacuzzi and relaxation area.